The José Guerrero Centre is located in a building rehabilitated in 2000 by the architect Antonio Jiménez Torrecillas (1962-2015), a professor and avant-garde architect of the minimalist school whose work is remarkable for its particular treatment of light, and who adapted this to the present requirements of museums with the collaboration of the artist Gustavo Torner. The building was first constructed by Indalecio Ventura Sabatell in 1892 to hold warehouses, following plans drawn up by the architect Modesto Cendoya, a representative of eclecticism and designer of the Hotel Palace on the Alhambra hill. In 1901, it became a printing shop, and from 1939 to 1983 it was home to the Patria newspaper, where the workshops and offices were installed. The building is located on Calle Oficios, in the Alcaicería quarter, which had been the most important trading centre of the Arab medina in Granada, mainly dedicated to dealing in silk. The Market and the Madraza are also located on the same street, the latter being the ancient Arab university and for many years home to City Hall. The Great Mosque was situated nearby, on the site now occupied by the Renaissance Cathedral and Royal Chapel, whose crestings form the backdrop to the panoramic room of the Guerrero Centre. Just as Alonso Cano, four centuries earlier, José Guerrero had his first studio in the bell tower of the Cathedral, and therefore this is a place charged with historical and artistic significance. The rehabilitation of the building, presented with an award by the Granada College of Architects in 2003, centres round the idea of the museum visit as leitmotiv, while also taking advantage of the architectural theme traced by the original building – the exterior opens onto the street, while the interior closes in upon itself, creating a space favourable for aesthetic contemplation. The dimensions of the building suited the type of museum finally chosen, based on its specialization, and on a human size and scale. (…) Opposite the majestic Cathedral of Granada, he built the José Guerrero Centre, a bold building, but nonetheless sober, abstract and austere, which, far from contrasting with the Cathedral, joined with it in recomposing the landscape of the city. Finished in the year 2000, the Centre is a clean, emblematic, sculptural framework for the painter’s work, but, for the visitor, it is also an ascent in search of light and, of course, a message for the future – a contribution to the city’s evolution (Anatxu Zabalbeascoa, El País, 21 June 2015). (…) The nineties were marked by the demanding commission of the Centro Guerrero, whose conception, begun in 1989, managed to surpass its mere consideration as a place of worship for the life and work of the painter. Since its inauguration in the year 2000, the Guerrero Centre has from the start understood the evocative capacity of new forms placed in contexts that keep alive the memory of the past, unlike the cultural and media colossalism of other art museums built during that time in Spain, that a figure such as Guerrero might have excused. Jiménez Torrecillas transformed the original building with remarkable skill and sensitivity into a museum that converts the façade into a skin and reduces the patio to structural references in the form of cast iron beams and pillars. 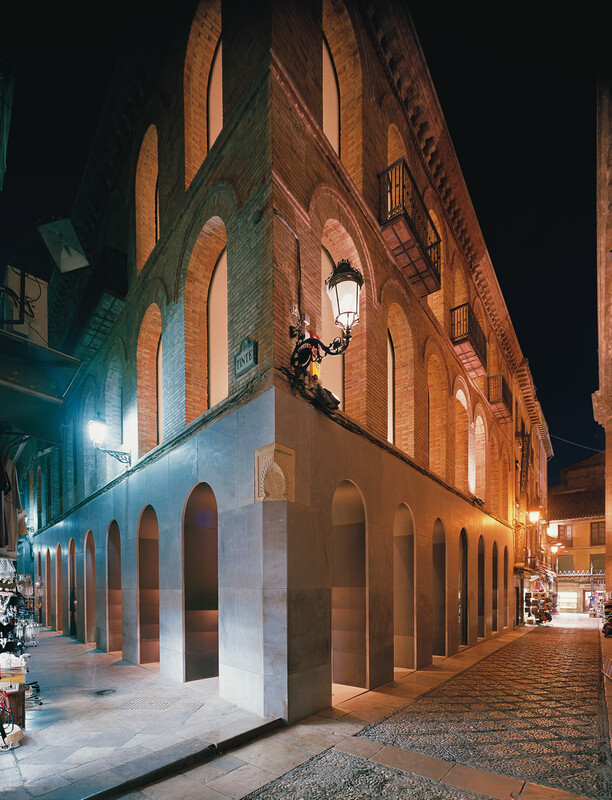 The exhibition rooms have superb technical quality, located as stages on an itinerary beginning on Calle Oficios, the attic is an architectural explosion that leaves the visitor to the contemplation of a city invariably linked to its landscape (Ricardo Hernández Soriano, Granada Hoy, 17 June 2015). Opposite the wonderful bulk of Granada cathedral, perhaps the most beautiful in all Andalusia, a little building has appeared, like David before Goliath, which not only stands as its equal, but also has an absolute respect and admiration for the historic building as the central theme of its design. The Patria building had previously stood there, and it had some worth, but the city had become used to it as part of the urban landscape. It is as if the old building had been turned inside out, like a sock, and thus resuscitated with first-class results. A highly ingenious reinterpretation has been made of the original spatial structure, consisting of an outer casing and an inner receptacle that became a patio. The outer casing has been manipulated without changing anything essential and the now closed inner box is used as the central exhibition space on each floor. Passageways and service elements are located in the intrados space. It is presided over and organized around a broad airy staircase. In the central, closed space the lighting is perfectly controlled on Guerrero’s large canvases in which a certain air of Rothko can be felt. The architect has avoided the temptation to create a larger entrance in on the ground floor. He has made a fine interpretation of the series of arches over the narrow street and has given more power to the walls by covering them in stone. There are some very deliberate details, such as the bevelling of the corner up to the first floor. The building is thus conceived with a clear strategy of a rising path around the central space. Like a vertical architectural promenade. A pathway in crescendo through spaces full of light around a closed central space. But, as it should be, the best comes at the end, in the culmination. When we think it is all over, at the top, surrounded by an explosion of light, a petrified landscape is revealed constrasting with the decidedly abstract shape of the museum. The Cathedral and its coronation of stone lace appears within hand’s reach. The lesson learned from Le Corbusier of the box open to the sky and the lesson of the Andalusian flat-roof have here been transmitted in an opening of the front to the sky, for opposite is that magnificent landscape of the Cathedral. The formal solution of directing this last room towards the Cathedral with absolute transparency is quite masterful. I am reminded of the luminous image of the Transparente altar by Narciso Tomé in Toledo Cathedral. It might be thought very daring, as it was, to introduce a baroque space onto a majestic gothic space. The splendid reality of the piece of sky full of impetuous light in the Transparente is so unquestionable as to be found in all the Histories of Art and Architecture. Here in Granada, a first-class architect has dared to work with a modern piece opposite the great renaissance monument. History is a living thing and time has a beat. With a very steady pulse, in this case, and the consideration that the key to this masterly architectonic operation is precisely that wise, fitting interpretation of History. The modern piece by Antonio Jiménez Torrecillas has its raison d’être in its admiration of the renaissance piece, whose value if anything is increased by this new first-rate architecture. When after a calm passage through the rooms of the Guerrero Centre we reach that space at the very top, that is like a piece of sky in the sky, we shall never want to leave. (http://www.plataformaarquitectura.cl/cl, 17 de febrero de 2009).